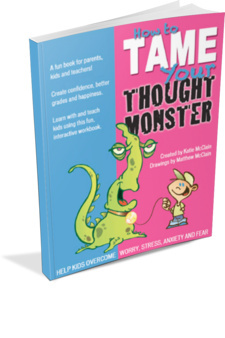 Below are the worksheets that go with the How to Tame Your Thought Monster eBook and App. Included are audio mp3s to guide you through some of the exercises. Download and print as needed. Click the image to download the file. All files will open in new windows. If you’d like to stay up to date with all my offerings and with the Growing Up Kind Curriculum which is based on the How to Tame Your Thought Monster books, you can connect with me by completing the Contact form HERE. Designed to be used in a linear fashion, the Self-Coaching Model has 5 parts meant to be explored in the sequence you see to the left, from CIRCUMSTANCES to RESULTS. This model can help you understand your thoughts so you and your kids/students can choose to find BETTER thoughts and tell BETTER stories in your life. It’s quite useful for adults as they can use it not only to clean up their own thinking, but it enables you to ‘stand in another’s shoes’ so you can see the likely perspective the child is coming from in their behaviors and results. Use the Find the Facts worksheets to help you and/or your kids be able to remove the drama from any circumstance — using a “just the facts” approach in order to clear up emotional confusion. Sometimes its hard to gauge how we really feel. Use the Find Your Feelings Ladder as a tool to help you see where your thoughts are taking you — are they raising you up the ladder helping you to feel better or dropping you down the ladder causing you to feel bad? (If you’re having trouble understanding this portion of the book, click the “play” button on the audio clip below and hear an example of me walking a client through it. Harness the power of Action Annie and train yourself to think powerful, positive thoughts so you can manifest powerful, positive action in your life the way Annie does! Become a Super Hero in your own life! Use the Practice Thinking Like a Super Hero worksheet to show you the way. Become a magician in your life and use that magic to help you manifest your dreams! Using the Practice Your Magic worksheet will help get you on the right track. “Practice makes perfect.” Practice using the methods outlined in the book to help you see that empowering yourself and your kids to find a better thought really is like magic! Use the Practice Using the Model worksheet to see the difference between feel-good thoughts and feel-bad thoughts. Want all of the worksheets combined into one handy-dandy easy-to-print file? Then go ahead and download the Complete Worksheet Set and get to work on meeting and taming your Thought Monster so you can feel better and do better in your life!